"Apparently, it took decades before some people figured out how to make money from this remarkable invention. 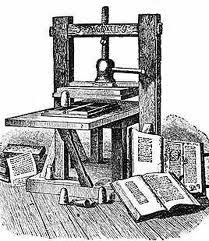 For decades after Gutenberg, it was not even clear that print would become a success. How do you market books? How many should you run off at one time? Piracy was a problem, as were texts changed, mutilated or combined in unauthorized editions. Many printers were ruined, trying to exploit the new medium."